August is upon us. The back-to-school sales have begun. Teachers are beginning to prep for the new year. It’s time to go shopping and stock up on those school supplies. I don’t know about you, but this time of year is one of my favorites. I love new beginnings, starting fresh and a new school year is always exciting. The chance to do better, be better, is always present in August for me. New school supplies, in particular, enhance that feeling for me. There is something about holding a brand-new pencil and opening a fresh, clean notebook that is so exciting. Brand-new school supplies set the tone for a new year and all the possibilities for learning and discovery that come with it. No doubt your kids’ school teachers have put out specific lists of generic items to re-stock the classroom. No doubt your kids have their ideas of what cool new items they want to bring to school with them this year. School supplies are a unique way for kids to express themselves. What are your kids clamoring to have this year? Here are 10 unique items that you may want to consider including on your shopping list to help keep your kids get excited about school. The Crayola name brand is synonymous with back-to-school. And, why not? Their crayons are hands-down the best! They always have fun, new products coming out. This year I’m loving the grade-specific supply kits. 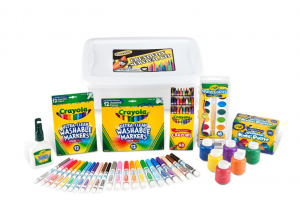 All your favorite Crayola products tailored to your kids’ ages. Yoobi is a fairly new school supply company. 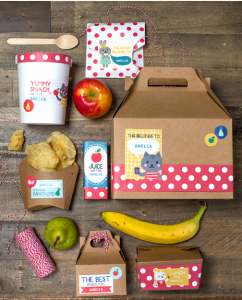 They have uniquely colorful and whimsical versions of basic supplies that are captivating for kids. And, their give-back philosophy of providing supplies to schools in need for each product purchased is appealing to parents. Many kids have loads of vocabulary words, history dates, terms, and such to memorize for tests. 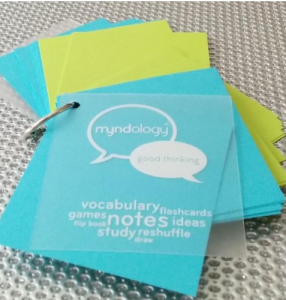 Instead of using those boring, basic white notecards, check these out. I love the Myndology flash cards. More colorful than standard note cards, an easy-to-use ring, and helpful sizes – these flash cards make memory work more fun. One of the daunting back-to-school tasks we Moms have to undertake is labeling all of the various school supplies and gear with each of our childrens’ names. But, there’s never enough labels of varying sizes, or labels suited for each product. Enter Lia Griffith. I think she is the queen of labeling. I love Lia’s whimsical products for keeping my kids’ things straight. Kids love anything that they can collect and trade. Bbuddieez is a new craze that may or may not have hit your local school yet. 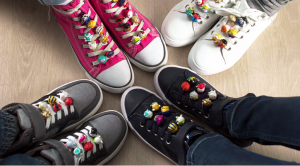 These cute, little collectible creatures clip onto wristbands, shoelaces, backpacks, hair…There are currently 26 Bbuddieez to collect, each one from a different world culture with an online profile for kids to read. A fun little item to decorate school gear and learn a little about the cultures of our world, too. Etsy is the perfect place to go for personalized anything. I always thought it was fun to have personalized pencils in my bag when I was in school. Etsy has many vendors providing fun, personalized school gear and supplies. I particularly love the products by OpheliaDesignsGifts. Do you have a daughter who is into the recent unicorn craze? 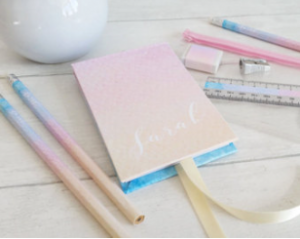 Ophelia’s watercolor stationary items would be a great addition to her bookbag. The ultimate in unique school supplies is to make your own from scratch. 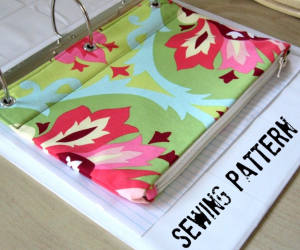 For crafty Moms and kids, why not choose your own fabrics and make your own pencil pouches, gym bags, and organizers? Your local fabric store has Disney-themed and sports-themed fabrics as well as color-coordinated quilting bundles. Then, head over to StudioCherie on Etsy where she has many highly-rated patterns for school items and much more. 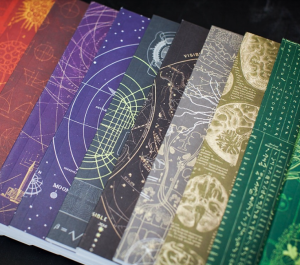 I love the science-themed notebooks, totes, and t-shirts by Cognitive Surplus. Perfect to tickle the fancy of your budding scientist. Sophisticated enough for high-schoolers and college-bound kids. Why not have a separate, note-taking bundle for each subject? Smiley-faced school supplies will make any kid happy to tackle the school day and to organize their school projects. Head over to Amazon to find many products that smile and wink at you. 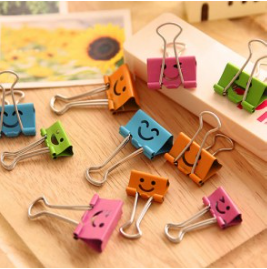 Many companies create binder clips, pencils, notebooks, rulers, sticky-notes, etc. all with a grinning face to keep your kids happy. Go on a smiley-face scavenger hunt! A fantastic way to encourage writing and nurture your relationship with your kids is through a conversation journal. In today’s busy world, it is easy to lose touch with kids unless you employ intentional parenting techniques. One such tool is the conversation journal. 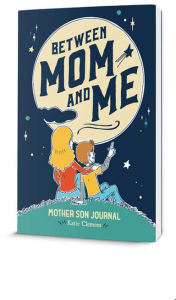 Head over to Amazon to find many specific journal styles including Mother and Son, Father and Daughter, and more. Most journals provide some fill-in-the-blank pages and writing prompts to get you going. Make sure you know what is going on in your kids’ lives when they are at school and with their friends! I hope this list inspires you to get creative with your school supply shopping. Employ your kids’ help for ideas and encourage them to express themselves with their school supplies. Make going back to school a fun adventure for all of you.